In Stroud, Green Councillor Phillip Booth kept his council seat with a whopping 68% of the vote. Sadly, this result could not be matched at the general election. Due largely to the squeeze on the Green vote due to the marginal nature of Stroud constituency, the Greens picked up about 1,500 votes (2.7%). For the full results click here. 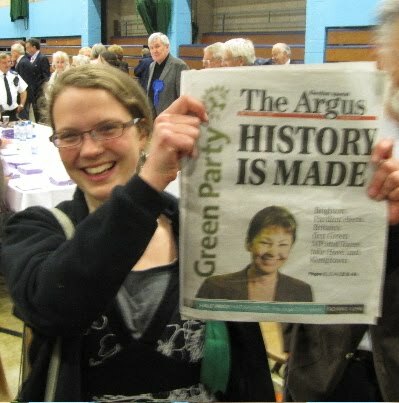 This election will go down in history as the moment when the Greens broke through to the UK parliament! I quite agree on the undemocratic nature of our first past the post system. Personally we voted green as our candidate was the only one we felt had much integrity, and we wanted to send a message to the Greens that they were supported. The result of our constituency was already assured so no loss of vote really! I have, since then, over heard more than one person saying that they “would have voted Green if we felt it would have made a difference.” Our system actually then, encourages people not to follow their conscience. Not a good thing! We need change!